Simple & Sophisticated | GALLA. 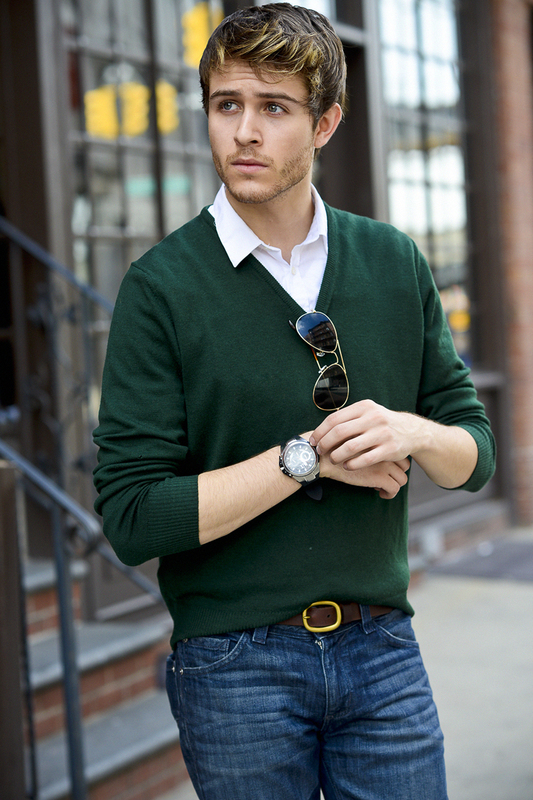 It’s no secret I admire a good styling challenge so when I needed a formal yet casual outfit, I immediately thought what better than my green sweater and denim?? I mean EMERALD of course. The color of the year remains strong in my closet, easily paired with blues, browns, burgundy’s etc. I really suggest you all own at least ONE item that’s of the green hue. I added gold sunnies and belt for a warm touch. 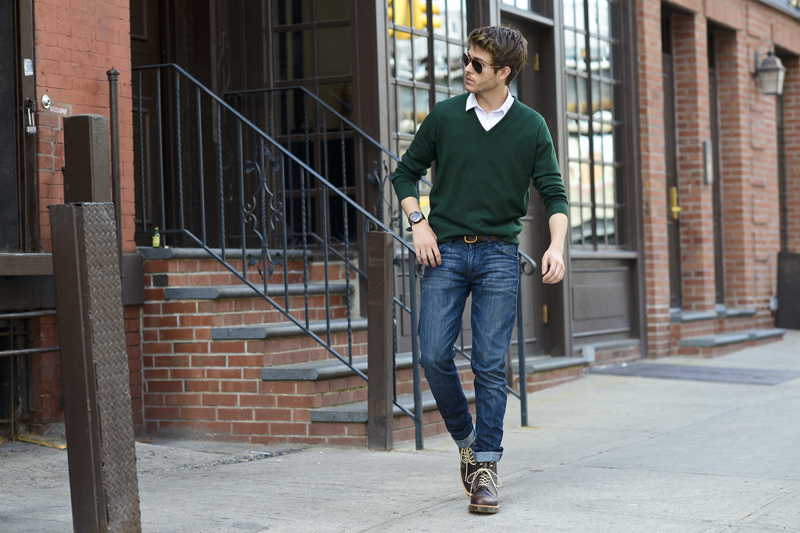 The dress shirt and sweater suggest a collegiate vibe but the denim and boots draw it back for a more relaxed approach. enter this weeks COACH bag giveaway yet? Looking good, as usual. 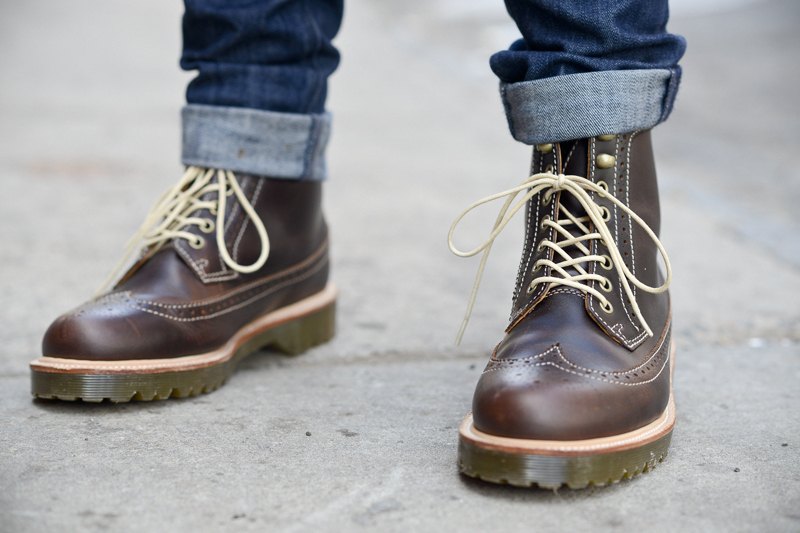 I’m always so impressed when guys can pull off Doc Martens/LL Bean boots and not look ridiculous. That sweater is so cute! I love the deep emerald color, the belt and those boots are perfect; masculine and great for giving some height (not that you need any ;-p). 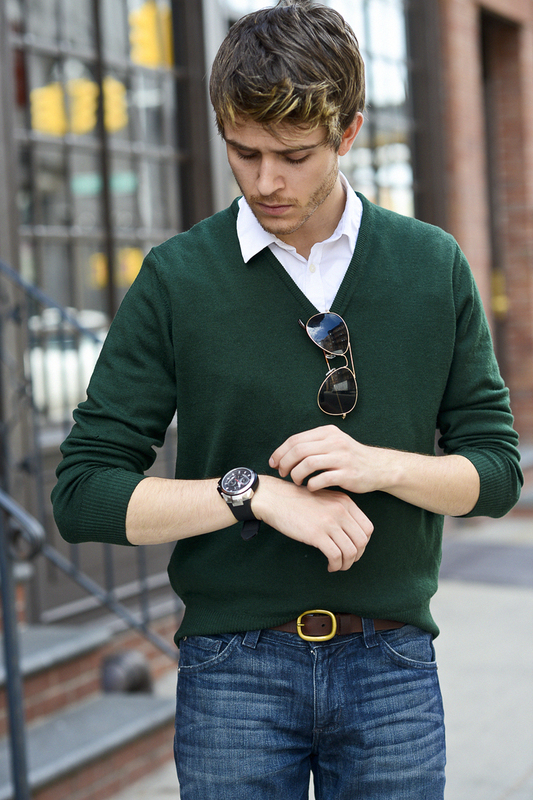 I love the watches that are showcased and handpicked, they morph right in with your outfits. They’ve got their lil edge to them. And I LOL’d about the parents. I can relate, nothing would mean more to them if I was decked out in sophisticated high fashion clothing all the time. I’m sure I’m not the only one here that would agree that your passion for fashion continues to inspire and resurge that spark to always look sharp and hopefully keep our mothers happy in the process, haha. Keep it up! It’s a perfect look. Love your sweater and sunglasses. Green looks so good on you! Love this simple look. Fajny blog, dobry styl pisania i super zdjęcia ! Jesteśmy CZWÓRKĄ CHŁOPCÓW , którzy prowadzą jednego bloga, więc może być ciekawie! Miło by było , gdybyście wpadli! It’s your colour! More green outfits! I like how green siting on you! I love the look of today! The clock is beautiful, wonderful and your pants as always gorgeous. Looking great as always Adam. It’s funny because I had a similar idea with the green. 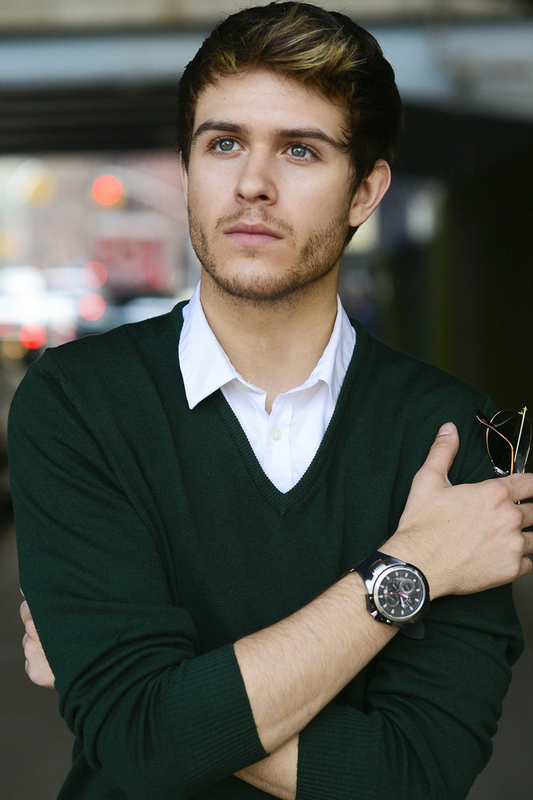 I shot yesterday with the same shade of green chinos. And was going for a simplistic look. Great minds style alike? You look perfect! Maybe it’s time to green for me?